Explore an outdoor space and collect leaves, flowers, mud and more to paint with. Crush and mix with water as needed and then create designs on your cloth. Ask your group to explore your space and carefully collect small amounts of natural samples from the soil, leaves, berries or flowers. Leaders should guide the group appropriately if there are poisonous plants or fungi in the area and make sure wildlife is not damaged through over enthusiastic collecting. Place the collected items in the pestle and mortar or in your tub and crush and add water to bring out the natural colours. Layout cloth sections on dry flat surfaces. If creating a relief use masking tape to create a design - such as initials or a simple shape. 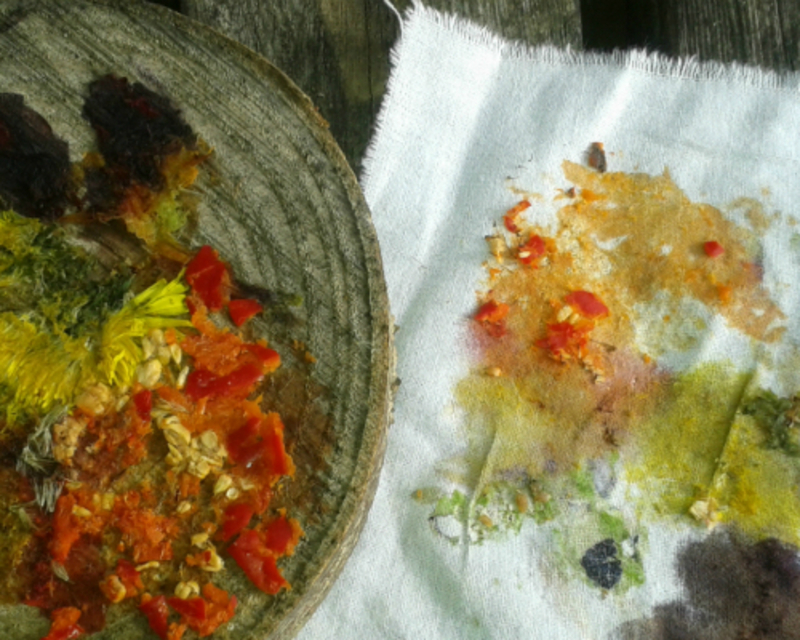 Paint using one or more natural colours you have made on your cloth. Hang up and allow to dry. Remove any tape. With some long sticks and a bit more tape you can make flags that can be used to decorate spaces or for playing wide games - such as capture the flag. Your painted cloth sections can be used to create the front of a handmade book or diary as part of a project.